If I could get a dollar for every time someone asked me for the time, I would be a millionaire by now. For the longest time, a watch was just a girly-cutesy statement for me. It was a just a timekeeping tool. That’s not the case anymore! Technology has evolved and so has the humble watch. From analog, mechanical, digital, chronograph, a combination of sorts and now the techno-wearable smart watches, it’s a paradise out there. I was bound to turn into this watch connoisseur that I’m now. And after reading this article, I’m sure you will too! 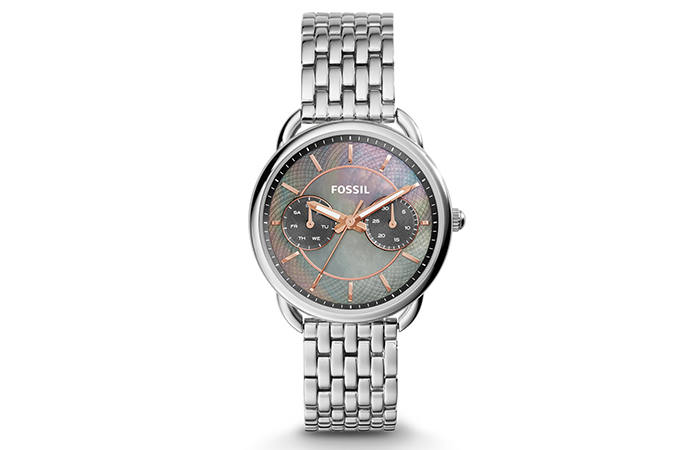 While at it, let’s talk about a brand I swear by – Fossil! 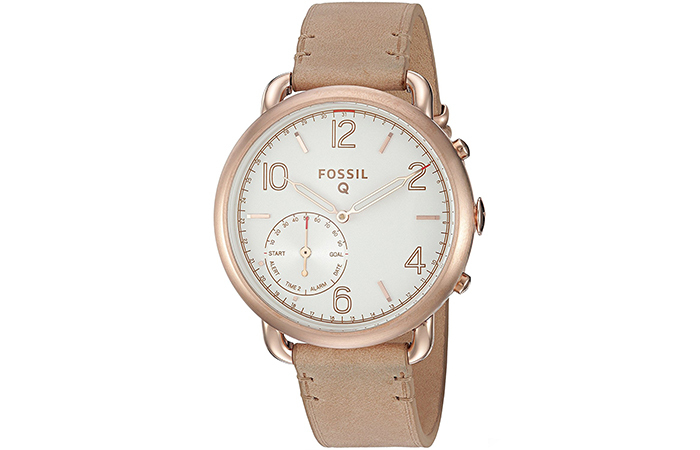 And list out the bestselling fossil watches for women. Let’s go over the list now, shall we? In the world of Fitbits and smartwatches, the tech savvy and the gadget freaks are spoilt for choice. Techno-wearable devices like these are stylish and upbeat. 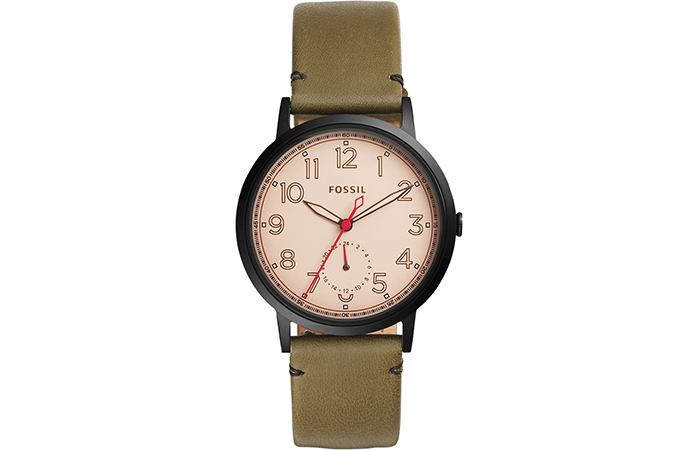 This newest arrival from Fossil gives you an option to customize faces, change the straps, and is compatible with almost all devices. And, of course, it is unisex. It connects to your phone and lets you sync data with your phone. With an inbuilt speaker, answering calls and reading texts and notifications just got a stylish facelift. It counts your steps and calories and lasts an entire day with every full charge. 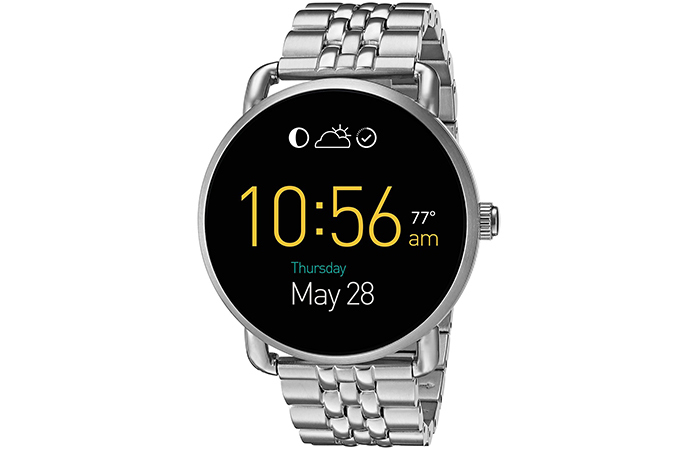 If you’re considering buying a smartwatch, this is one of your top contenders. 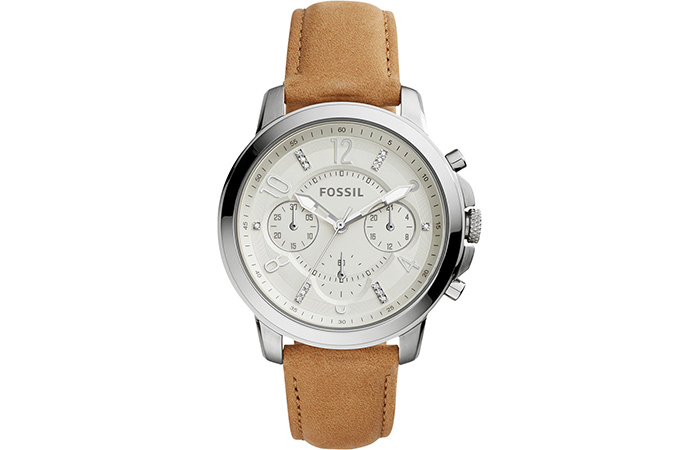 Tan is a Fossil staple and a signature color across all products. One color that can be donned with both your formal and casual wear. 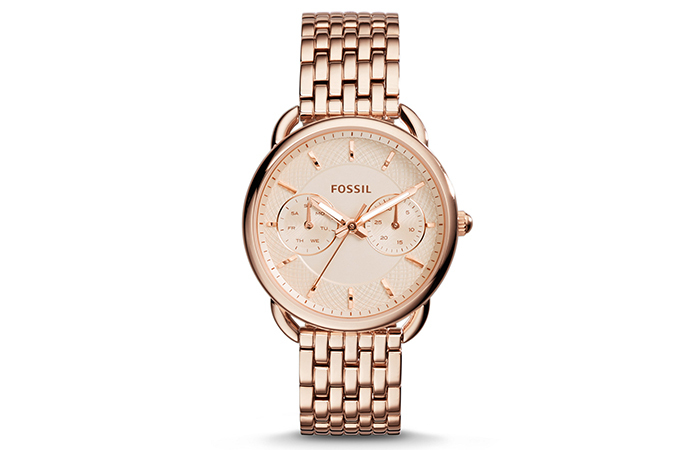 If this is your first Fossil purchase, go with this color or model or both – it will never fail you. A variant that is inspired by the traditional watches, especially the chronography. It comes in black, brown, and tan. The best part of this effacing beauty is the diamond logo on the second’s hand. It is water resistant, and the straps can be changed. But, this color is my favorite – it’s unique and not something you’d see everywhere. A quintessential Decker model for men has found its way into women’s watches, and we are glad it did. 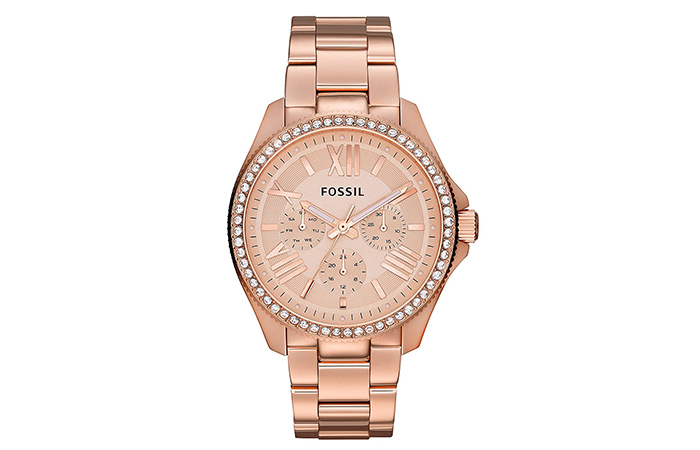 The feminine touch of rose gold, the crystal embellished dial, and chronograph design make it every bit exciting and stunning. 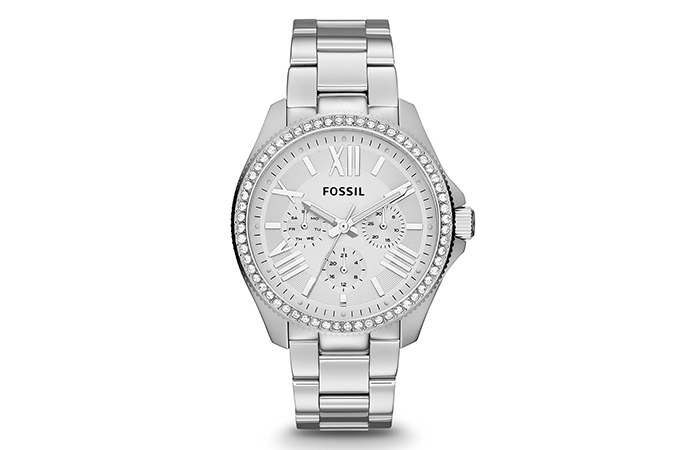 An analog watch in silver, American diamonds, and stainless steel. It is more than just a watch – it is a statement. Stainless steel is a sturdy material that can last forever and will continue to have the same sheen with little or no maintenance. We have heard of smartwatch; we have heard of analog. Here’s a blend of two good things into one – it’s a no-charge hybrid wearable. It is compatible with Android phones and versions after iOS 8.2. It automatically syncs with your phone, tracks your steps and quality of your sleep and duration, among other things. The battery lasts for a little over six months, depending on the usage. 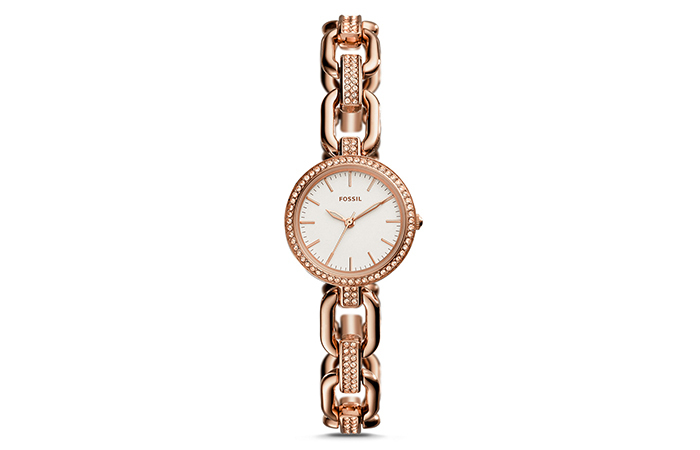 A slender body of stainless steel in rose gold and sparkling pave accents will brighten up anyone’s day. It is a perfect party wear accessory. You could also consider gifting this to your loved ones, your mother(in-law), sister(in-law) or anyone else. It makes for a timeless and thoughtful gift. 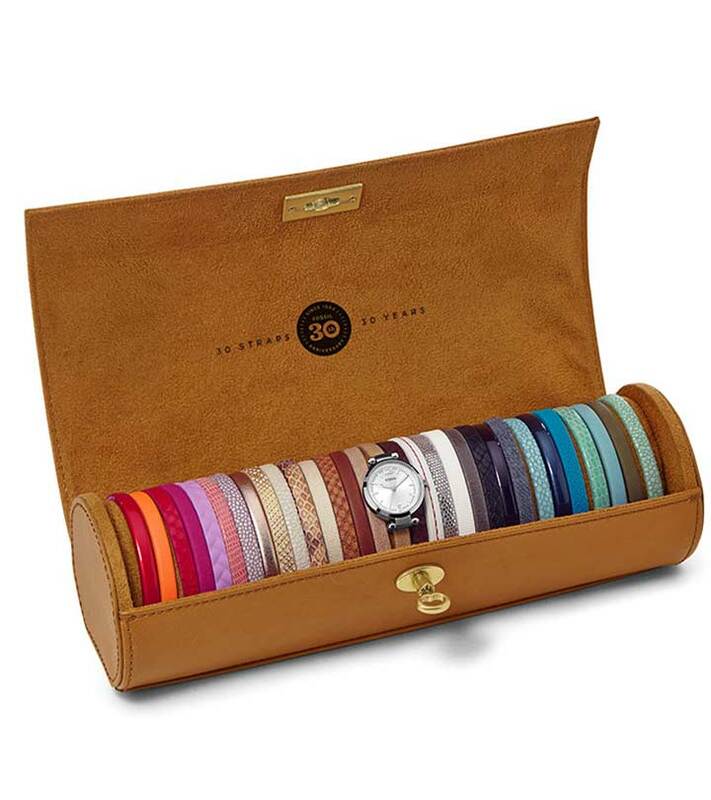 A smart choice of design and color that should be part of every watch lover’s collection. It goes well with casual wear and makes a statement by itself. Wear it with shorts, khaki pants or military hot pants – you’re all set for an effortlessly grungy look. The silver dial and the three hands of the analog watch in rose gold, and the gold Roman numbering make this watch an overall stunner. The stainless steel silver chain and gold coated loops make a classy statement. It goes well with traditional outfits. A classy, simple, black strapped watch is a must-have and a bare essential in a woman’s accessory collection. It is one of my personal favorites and an eternal model that will never go out of style. If you’re are one of those who wear their watch on the right hand, even better. Consider getting one of them. 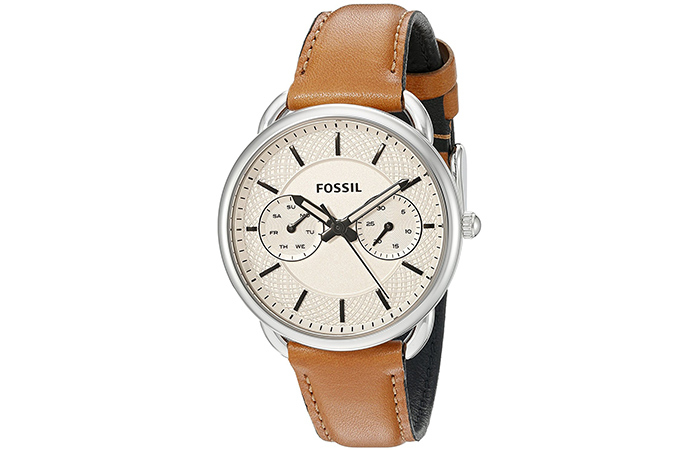 Another classic choice of color and make from Fossil. 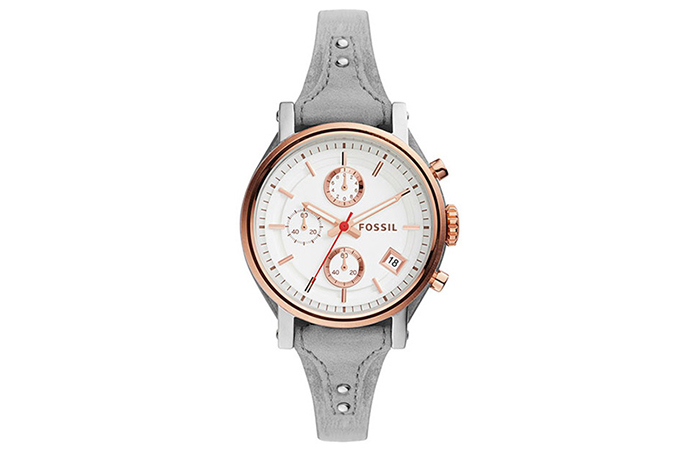 The gray leather strap has intricate design details, like the thread finish and steel buttons. The round white dial with three golden indexes makes for a collector’s delight. A polished design for the classy lady in you. This battery powered watch with a quartz crystal in silver leather, white dial, and black indentation for the numbers make this piece irresistible. If you love monochrome designs, you will fall for this instantly. It’s water resistant and can take the pressure of shallow swimming pools. It is definitely wearable around the sinks, kitchen, etc. 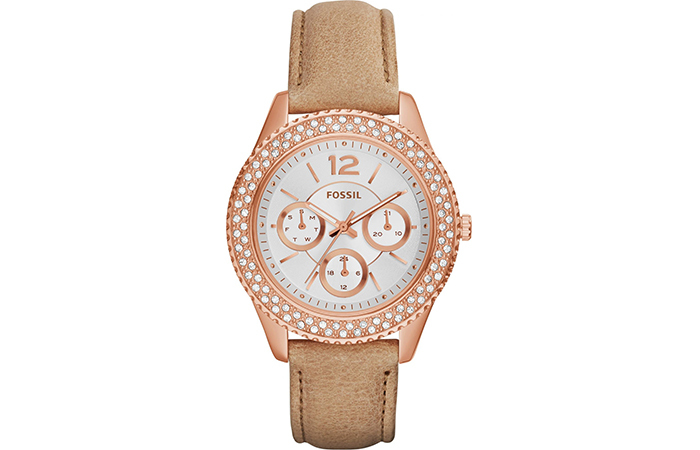 With a crystal studded bezel, rose gold dial, and quartz movement, it is topping the charts and winning hearts. And, I can see why! 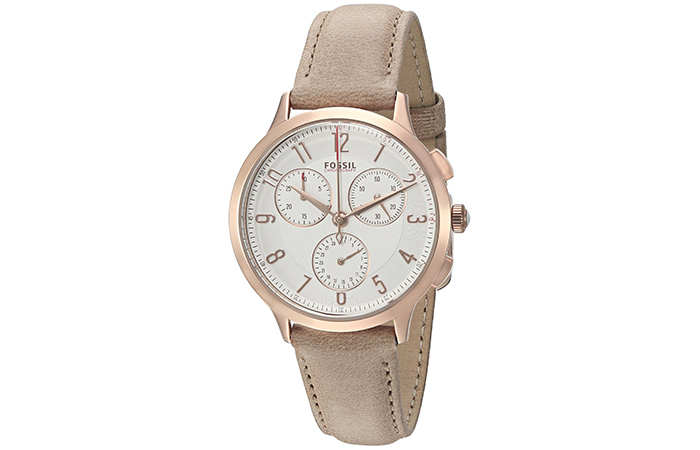 Fossil has been a game changer in women’s watches and other accessories. They know exactly what we are looking for. Don’t you agree? Listen up, girl. If your choices are inherently tomboyish, this might interest you. Even if you are not, and your choices are subtle like me, it’s still an impeccable choice. It is a multifunction watch that comes with stopwatch functionality. The sparkling index hands add the much-appreciated shine to this masterpiece. An everyday essential and stylish addition to your watch collection. Wear this on a casual Saturday or a lazy Sunday just when you’re not in a mood to deck up too much, but still want to look presentable. Durable, robust, and stylish – too many good things in one. 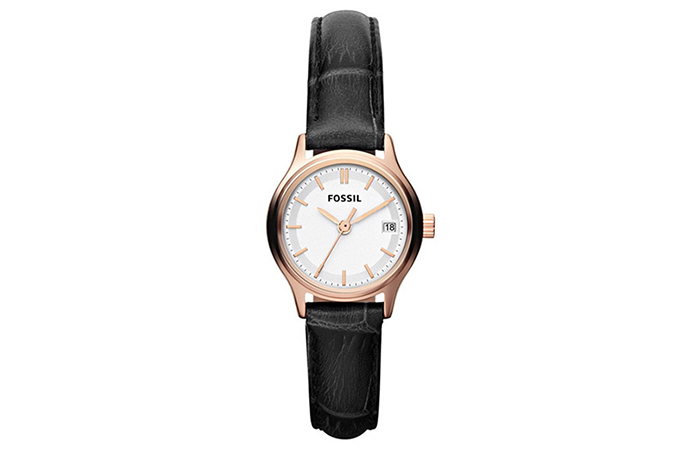 Tailor is a collection launched by Fossil that has a fresh take on femininity. It has a stainless steel body and plating. This version of the dial is called Spiro graphical design and comes in breathtaking pieces like this one. You look at the watch, and the first thing that comes to your mind is the lit up sky and twinkling stars, basically a whimsical aura. The rose gold accents pop the look further. Owl designs are practically taking over the fashion world. 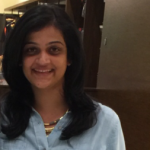 You name it, and they exist – tops, dresses, tanks, accessories, cases, and watches. 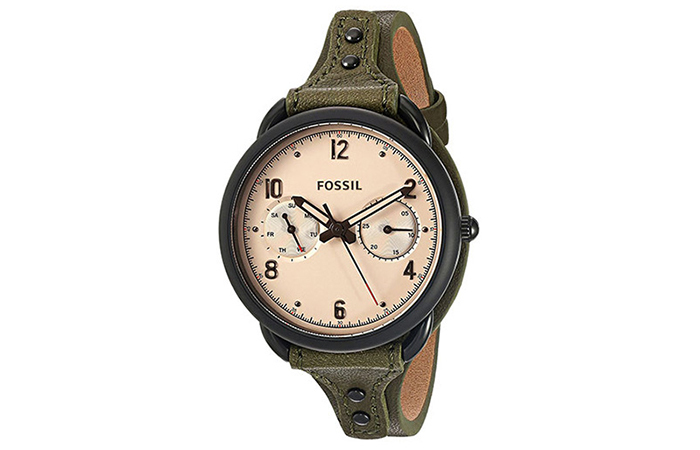 However, brands like Fossil add to the aesthetics with smart additions like these. The numerics on the owl’s pupils indicate the time. Isn’t it cool? 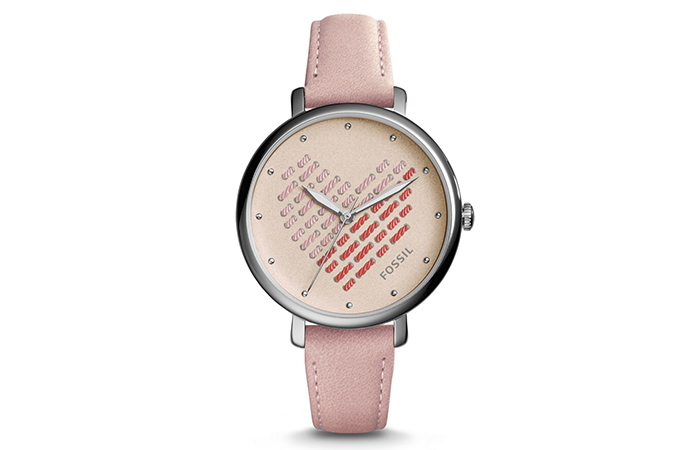 A novelty dial in powder pink and a DIY inspired theme – that’s the Jacqueline watch for you. The heart beats as the clock ticks! 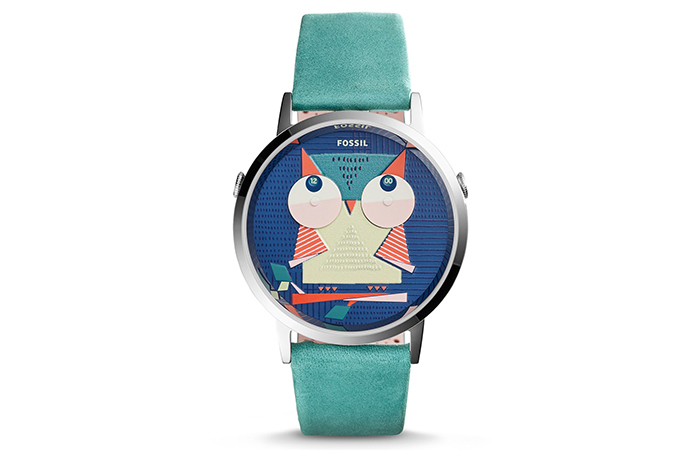 The quirky take makes this a fun addition to your watch collection. What better color to define feminine charm than pink? Maybe stereotypical, but pink remains my favorite color, and I’m thoroughly impressed. We get bored of our accessories pretty quickly, and it does not matter even if they had cost us an arm or a leg. At least, that’s how I am. And, for all of us like me, here’s something Fossil has to offer. I am already excited. A case, all by itself, that will fit any generic 18mm lugs. It just got twice as interesting and fun! 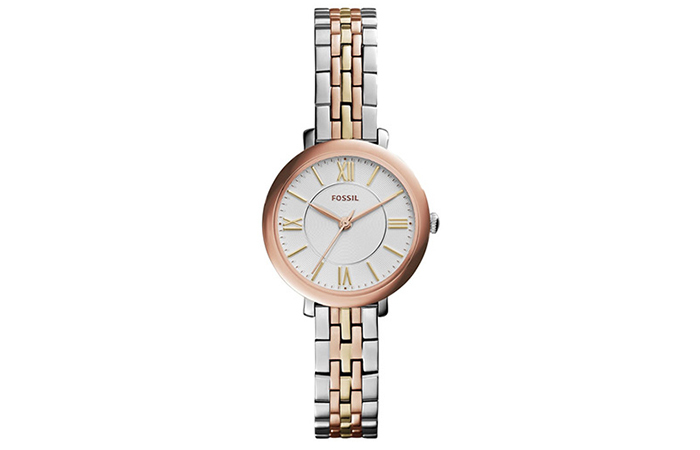 A dandy hand-crafted rose gold watch that is classic and sophisticated. Play along with the straps and get creative to take this to a whole new level. 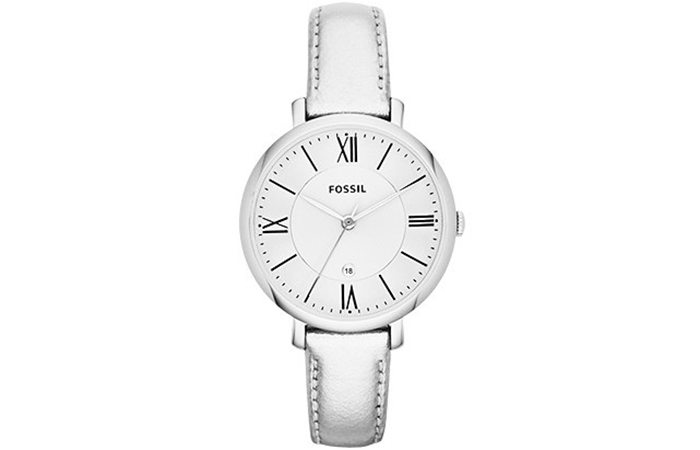 Here comes another masterpiece among the fossil women watches from the Tailor collection. Remember the exclusive feminine collectible edition they launched? Yes, this time in rose gold (which I can never get enough of) in a seven-link bracelet chain. It is something I cannot seem to take my eyes off from. The precision and detailing of this compelling design are commendable. It makes for a promising anniversary gift, or for that matter, any special occasion. Either way, the recipients are sure to be swept off their feet. Whether it is for gifting someone else or your ownself – a watch will never fail you. Which one do you like the most? Also, is the watch just an accessory for you or a functional wearable? We’d love to know what you think. Drop in a message or two in the comments section below.